PR-606H includes HUB Blink/Link features for easy active Ethernet outlet, cable and switch port identification. The PR-606H is designed specifically for locating and tracing cables on inactive or active networks, and live or dead phone lines, as well as coaxial video cabling systems. Today’s media networks have a combination of twisted pair data, telephone voice, coax and security/alarm video wiring. It provides 2 selectable powerful Net and Tel tones allow cabling installers, Datacom/Telecom technicians directly plug into an active networks, patch panel, wall outlet or live phone line, makes it easy to quickly isolate the right cable in the equipment closet, and locating an unlabeled network cables during installation and troubleshooting. 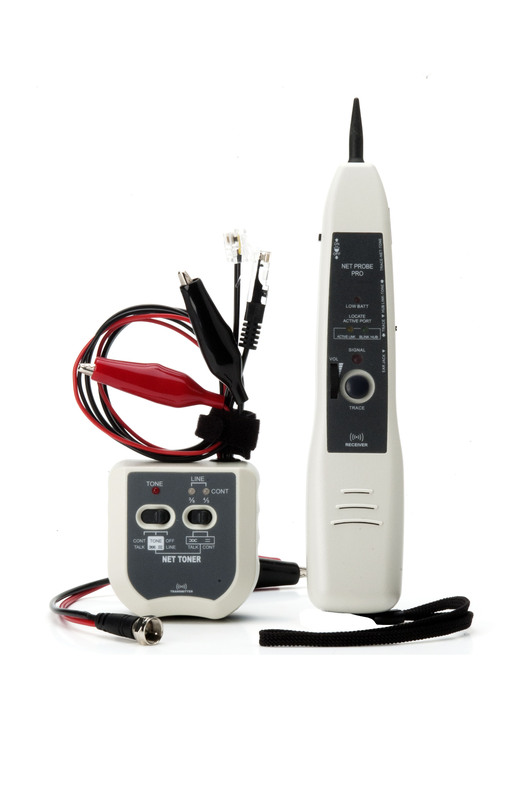 It also tests cable/wire continuity and can determine Line 1 and Line 2 polarity and voltage, as well as supply talk battery power to allow communication over inactive test sets. Built-in both of RJ45 plug cable is used for tracing inactive and active Ethernet cables connected on Hub/Switch/Router, and RJ12 plug cable is used for tracing dead and live phone line and verifies Line 1 & Line 2 polarity. Alligator clips are used for testing wire continuity and toning on coaxial cables, non-terminated cables or punch down blocks, as well as for connection to supply talk battery power. The Net Probe comes with adjustable volume control and an earphone jack for noisy environments, low battery indicator, easy tip replacement, and lanyards attachment point for hand-free operation. It is also equipped with a visual signal strength indicator for easier locating target wire/cable and adds useful features of active Ethernet port ID- Hub Blink and Link Mode for fast identifying the termination port of an Ethernet wall outlet or cable on the active network devices by blinking the Hub/Switch/Router link port light. The Link indicator for easier identifying whether an Ethernet outlet or cable is an active Ethernet port. It also has a built-in Flash Led Light can help you to find the target wire/cable in dark field. 1. Outputs 2 selectable powerful tones for tracing and locating active and inactive cabling systems. 2. More effectively trace cables on Hub/Switch, patch panel, termination blocks or within bundles. 3. Quickly and accurately solve active LAN and live phone cabling installation and troubleshooting jobs. 4. Verifies wire/cable continuity, and detects short or open circuits. 5. Determines telephone Line 1(4/5) and Line 2(3/6) voltage & polarity. 7. Built-in RJ45 plug cable for tracing both active and inactive LAN network cables. 8. Built-in RJ12 plug cable for tracing live phone line and verifies Line 1 & Line 2 polarity. 9. Alligator clips for testing cable/wire continuity, toning on non-terminated cables and for connection to supply talk battery power. 1. With a visual signal strength indicator for easier locating target cables. 2. Comes with adjustable volume control and replaceable no-conductive tip. 3. Built-in RJ45 jack for receiving clear tone signal and using Hub blink connection. 4. With an 2.5mm earphone jack for noisy environment and low-battery indicator. 5. Hub Blink & Link Mode for identifying which port on a switch that a wall outlet is connected. 6. By blinking Hub/switch/Router link port light for fast identification active Ethernet port ID. 7. Link Led indicator for easier identifying whether an Ethernet outlet is an active Ethernet port. 8. Built-in flash Led light for easier finding the target wire/cable in dark working environment. RJ45 plug cable, RJ12 plug cable and alligator clips.